It’s true that it’s the winners of any conflict who write the history and, in the world of broadcasting over the past few years, many could claim to have won the battle for the eyes and wallets of the next generation of TV viewers. Leading that list are Netflix and the other tech giants, with Google and Facebook hoovering up attention and digital advertising money. Production budgets are rising as the FAANGs commission premium video. For broadcasters, platforms and content companies like Disney and AT&T eager to reposition themselves, there has been a rush to scale up and broaden out. But there is also a new theme tune emerging: at the IBC conference in Amsterdam last week, it was loud and clear that these companies are focusing on leveraging their own assets to play in the new, hyper-connected and competitive media space. Tim Davie, the chief executive of BBC Studios – which was formed from the merger of BBC in-house production and the public service broadcaster’s commercial distribution arm – emphasised that creative deal-making at pace is the only way to win. He said the days when the broadcasters held all the chips and “you could make someone dance in the corner for two years waiting to be greenlit” are over. BBC Studios greenlit His Dark Materials, based on the book by Philip Pullman, alongside content investment fund Anton Capital Entertainment. The multimillion-pound series was well into production when AT&T-owned HBO came in as a co-funder this month. Meanwhile, Viacom has rapidly stepped up its embrace of audience fragmentation by creating Viacom Digital Studios (VDS). The unit’s president, Kelly Day, who reports directly to Viacom boss Bob Bakish, told IBC that being relevant and meaningful to younger audiences means embracing social platforms like Snapchat and YouTube. This is something she has experience with from her days as chief business officer at AwesomenessTV, a digital-first studio for teenagers that was bought by Viacom in July. Viacom recently reinvented the classic MTV celebrity home series Cribs for social video service Snapchat. It hung onto the sponsorship rights and the show has subsequently been a financial success. Day’s team has also tapped into a “nostalgia audience” for those who grew up with the Nickelodeon character SpongeBob Squarepants, who is celebrating his 20th anniversary next year. Called Bikini Bottom Mysteries, this darker short-form series is based on some of the secondary SpongeBob characters. Day is clear that “going to the platforms where the audiences are already” is the key to repurposing Viacom’s IP for a new generation. Underlining the interest of investors in the legacy media sector at IBC, Abe Peled, a long-time News Corp executive and industry TV guru, unveiled his new, private-equity backed company to help broadcasters embrace IP distribution and targeted TV advertising. “The pay-TV world is not going to be run off the cliff as soon as people think,” he told me. Peled said the problem with Silicon Valley professionals is that many don’t realise plenty of people are still watching lots of pay-TV, even if they pay less for it. “I think they’ve been living in a cave in Silicon Valley,” he added. Both Netflix and Google’s YouTube were espousing partnerships with broadcasters and platforms at IBC, so maybe they’re already out of their respective caves, but the clout these tech players have is not to be underestimated. 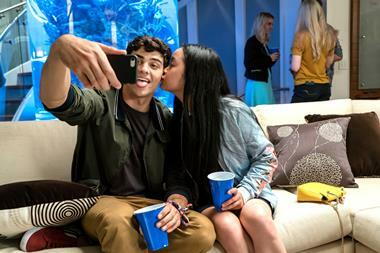 When the Viacom-produced Netflix film To All The Boys I’ve Loved Before debuted on 17 August, male lead Noah Centineo had 500,000 Instagram followers. A month later, he has 11 million. You do the maths.